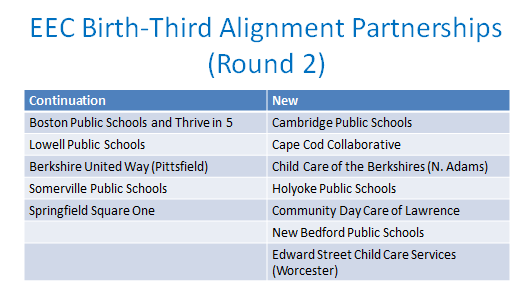 Congratulations to the twelve communities that recently received Birth-Third Alignment Partnership grants from the Department of Early Education and Care. Momentum around Birth-Third continues to grow in Massachusetts, and we are expanding the base of experience that all communities can draw on and build from as they work to improve children’s early learning experiences. The graphic below is from a presentation to kindergarten coordinators that I am doing in different parts of the state with Donna Traynham and Mary Jane Crotty of the Department of Elementary and Secondary Education. 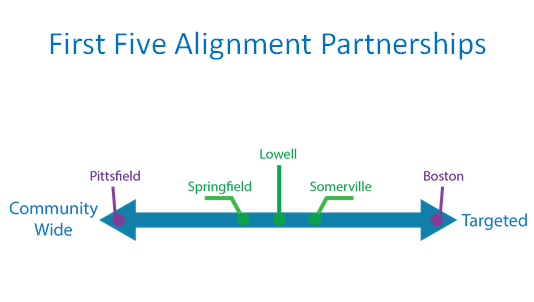 The graphic shows how the strategies of the first five alignment partnerships fall on a continuum of community-wide to targeted strategies. I would be happy to visit any of the Round 2 communities and share this presentation on the strategies of the first five alignment partnerships (gratis). The work of these communities could provide food for thought as you form your plans. Feel free to contact me if you would like to arrange a time for me to visit.